View from upper Styx Branch drainage. There’s something I don’t like in the foreground. 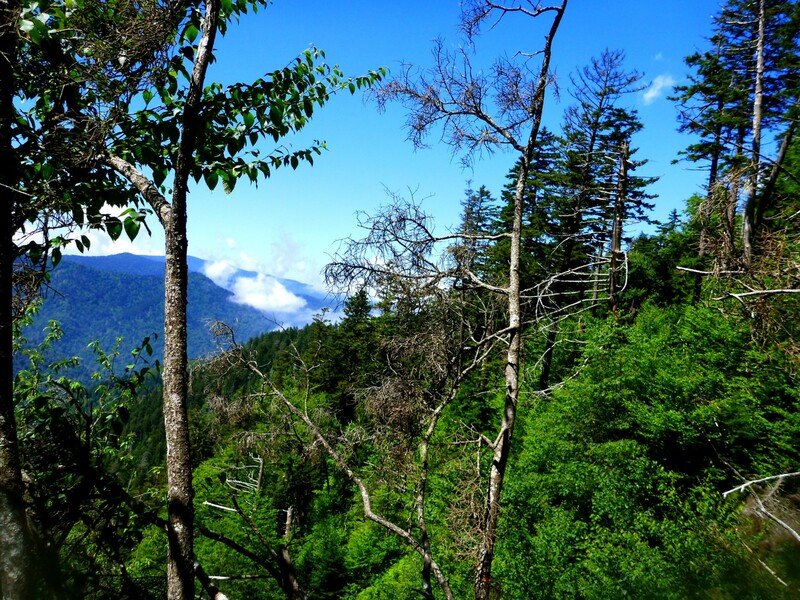 For the first time in weeks, the forecast for Gatlinburg said nothing about precipitation. I had to get out on this beautiful day! 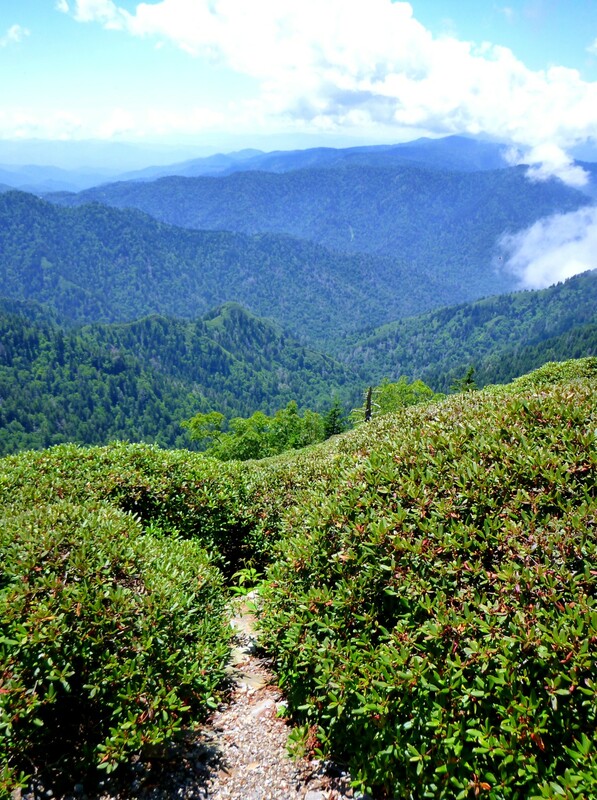 So I climbed Styx Branch to Myrtle Point on LeConte. I’ve been up Styx four or five times via different routes—some accidental rather than intentional. This is the first time I’ve done it by myself. Readers may notice that lately I’ve been doing more solo bushwhacks than usual. I always enjoy hiking with my disreputable comrades, but this summer I’ve been in a mood to explore the feeling of being by myself in really wild places. 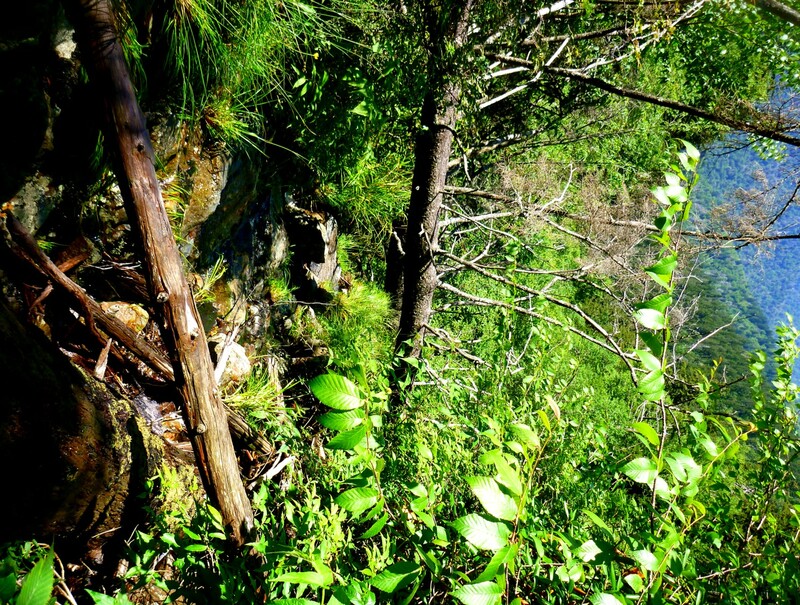 Yes, being a few hundred vertical feet below the popular tourist destination of Myrtle Point is a really wild place. Check it out sometime if you don’t believe me. From the bottom. I hiked the familiar lower stretch of Alum Cave Trail until I reached the footlog above Arch Rock, then headed up Styx Branch. 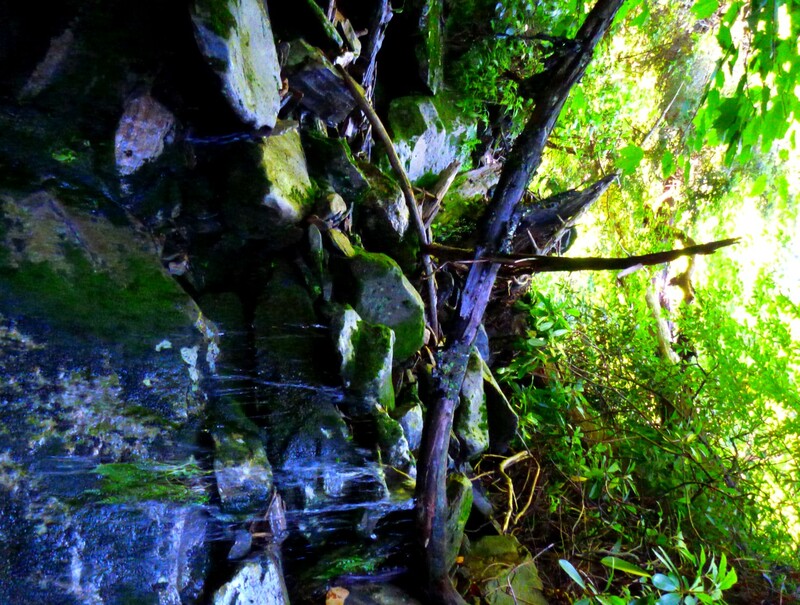 At the footlog, it carried a fair amount of water, but soon Styx lived up to its usual identity of a stream that often flows in subterranean paths, offering an unusually dry route for off-trail types. And you thought Styx got its name because it goes through Huggins Hell. No, it’s because it issues forth from diabolical realms far below the earth’s surface. That’s my story and I’m sticking to it. I expected to see some new landslides after the recent phenomenally heavy rains, and I was not disappointed. Nothing super-dramatic, but noticeable. New slide coming down from the Parton Peaks ridge. 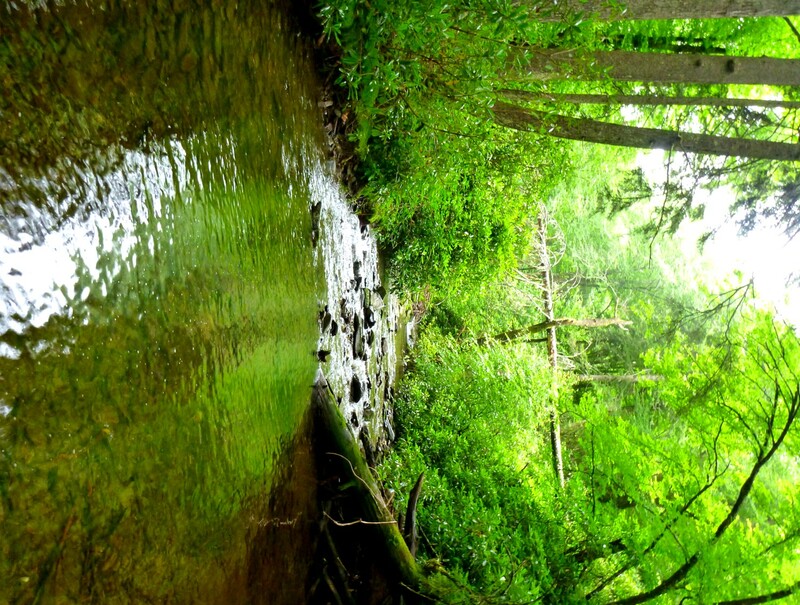 I turned up the left fork and proceeded up the stream. 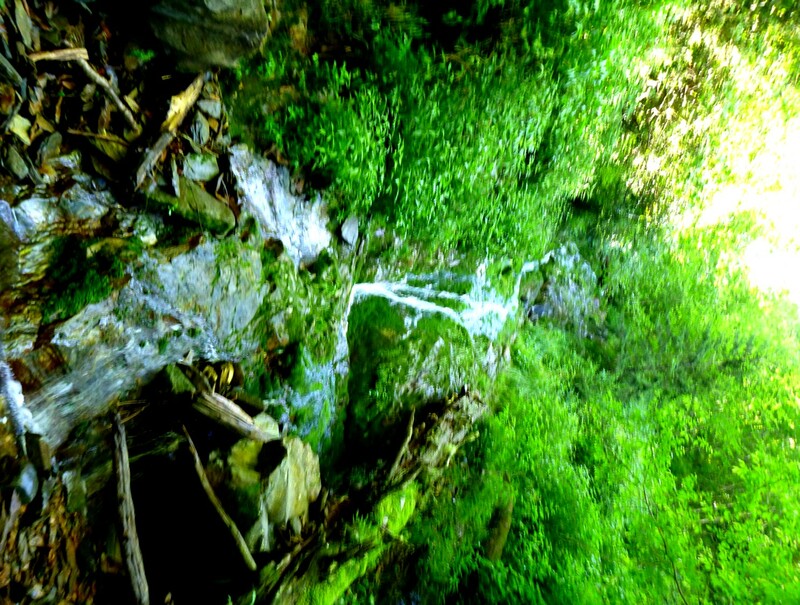 Small cascade on left fork of Styx. 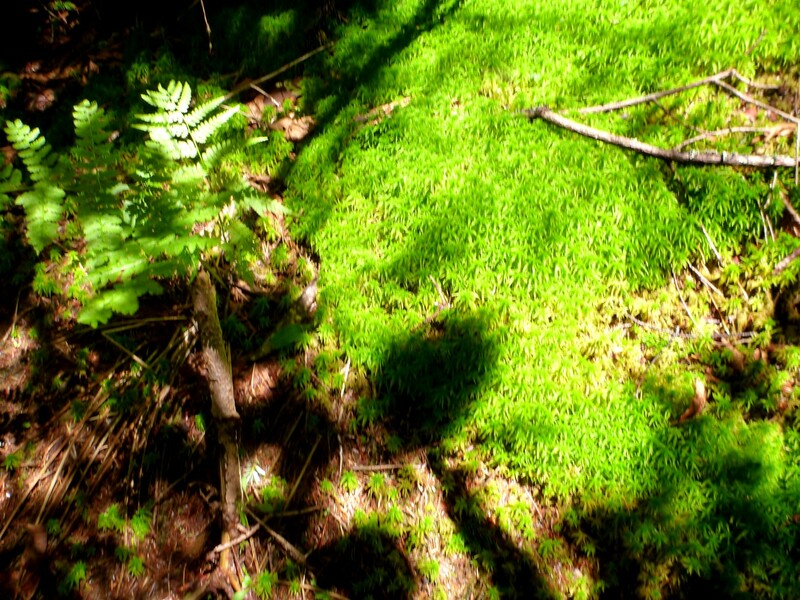 I encountered the thickest, woolliest vegetation of any time I’ve been up in this area. Has the rainfall been saturated with Miracle-Gro? I also noticed that more blowdowns blocked the stream than I’d recalled from previous outings. As I’ve whined about on other recent blogs, the heavy rainfall and the thunderstorms seem to make it easy for trees to become uprooted. I got into one particular spot that gave me ridiculous difficulty. It wasn’t dangerous, it was just incredibly awkward. One of those situations where one foot was on the slimy branch of a blowdown, the other foot on a slippery rock, and I was trying to leverage myself up by one arm—surely the push-ups I’ve been doing lately should help—and the branch I was leaning on snapped off. Getting into the area of tall cascades. Starting to make upward progress. Now I’m in the halls of the mountain gods! I reached the perimeter of a big landslide area (not a new one—it’s been obvious for a long time). 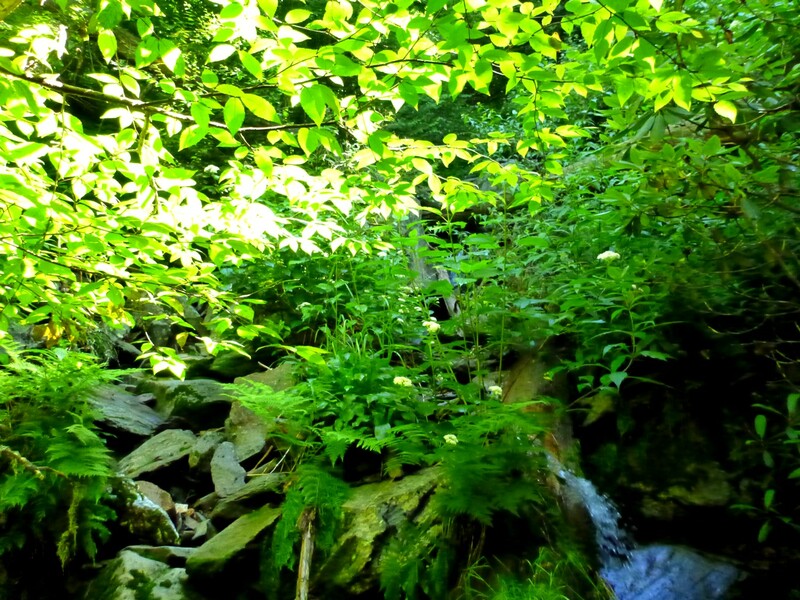 I climbed along the edge on steep gravelly soil and opted to move into pleasant open balsam woods. But when I saw a nice open meadow to my right, I traversed over to it. I was unpleasantly surprised to see that it was covered with a parasitical plant called dodder (which you also see in the top photo). 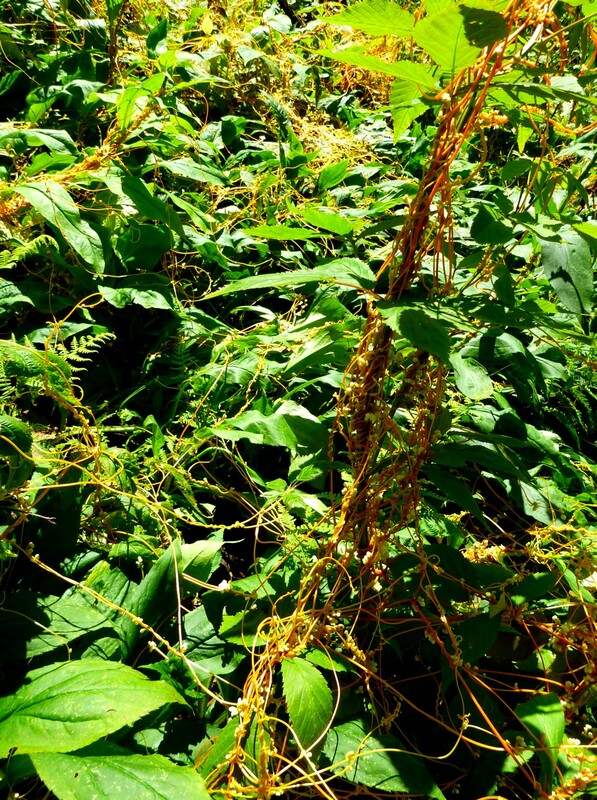 Cuscuta gronovii, better known as dodder. It’s not one of those invasive plants that’s arrived in shipping crates just recently from overseas, it’s been around for a long time. My wildflower book says the Cherokees used it for medicinal purposes. Yet this is the first year that I’ve seen it in any quantity in the Smokies (if you’ve had a different experience, please let me know). I saw it last weekend along the A.T. near Mt. Cammerer, and now I see it all over the upper slopes of Styx, where I haven’t seen it before. Perhaps something to do with our bizarre climate this year? It’s been around in the Black Mountains for a while, especially the northern Blacks like Celo Knob, where I saw tons of it on a traverse of the Blacks. 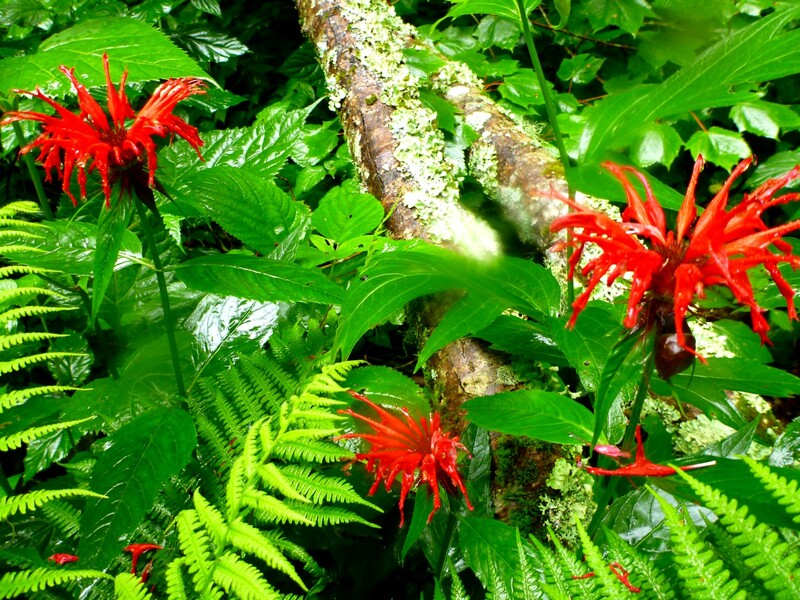 The wildflower book describes these vines as “parasitic annuals that lack chlorophyll. They attach themselves to a variety of host plants from which they derive nourishment through rootlike connections.” It’s also known as “love vine,” the book says. Funny! 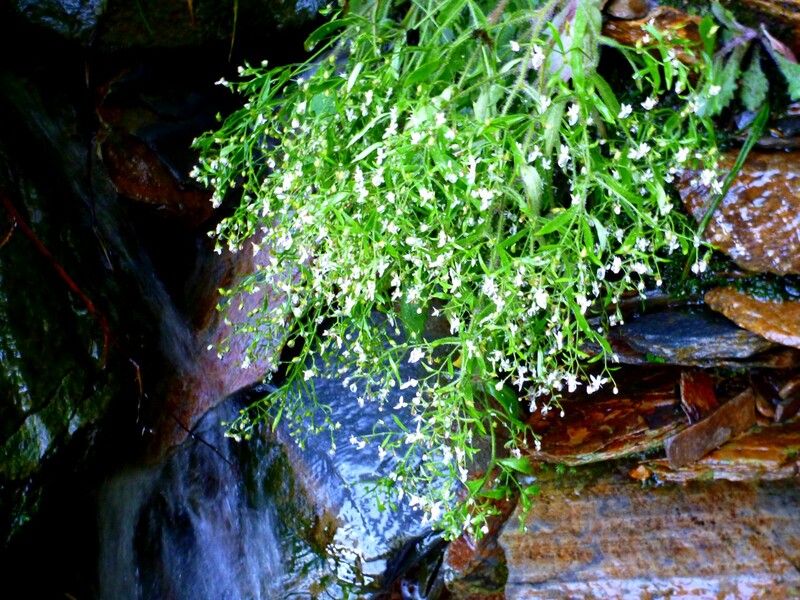 Mistletoe, another plant associated with love, is also parasitic. Hmmm . . . can anyone come up with a concept of love that doesn’t involve being a parasite? I climbed steeply through these meadows of dodder, trying a route to the side that led to a combination of Rhododendron minus and Anakeesta bluffs, worked my way through, and popped out on the Myrtle Point side trail just steps away from the Point. Some people came through just as I emerged from the brush. This time, oddly enough, they assumed that I was some sort of worker attached to the Lodge. Two separate groups both said something like “Thank you for your efforts” as I stood by the trail, removing my gloves, attempting to brush spruce and balsam needles from my clothing. Come to think of it, I didn’t see any other solo female hikers even on the Alum Cave Trail going down. I like to think of it as sort of a blank area of experience. In the end, I’m glad it’s that way. Posted by Jenny in nature, travel, weather. Read Chasing the Monsoon by Alexander Frater. * It’s about a man who, after a spell of physical illness and mental stagnation, breaks out of his torpor and embarks on a journey to follow the course of the monsoon in India. 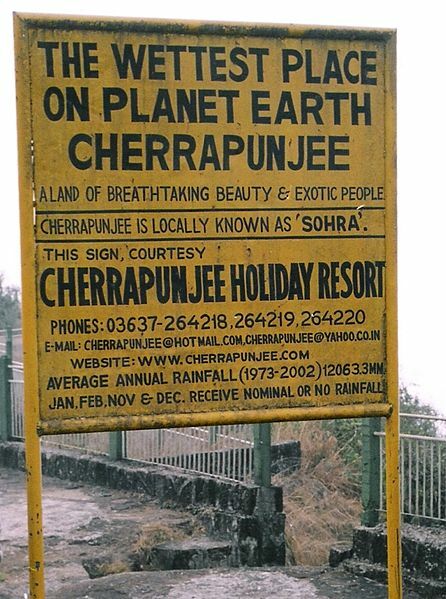 His final destination is Cherrapunji in the northeastern state of Meghalaya, a small town that holds the world record for the most rainfall in a calendar month and in a year. Those records were set during a freakish period. 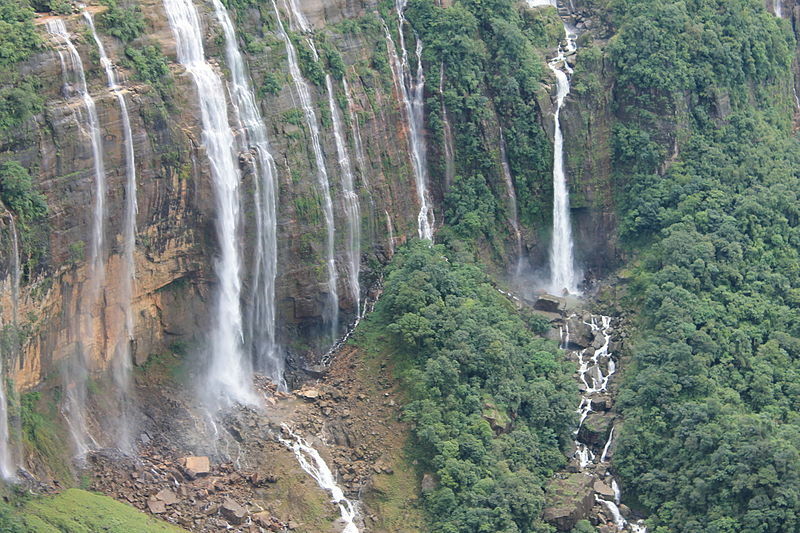 Cherrapunji received 366 inches of rain in July 1861 and 1,042 inches between August 1, 1860 and July 31, 1861. Yet despite what the sign says above, it is not currently the wettest place on earth. That title is in dispute between Mawsynram—a village close to Cherrapunji—and Lloro, Colombia. 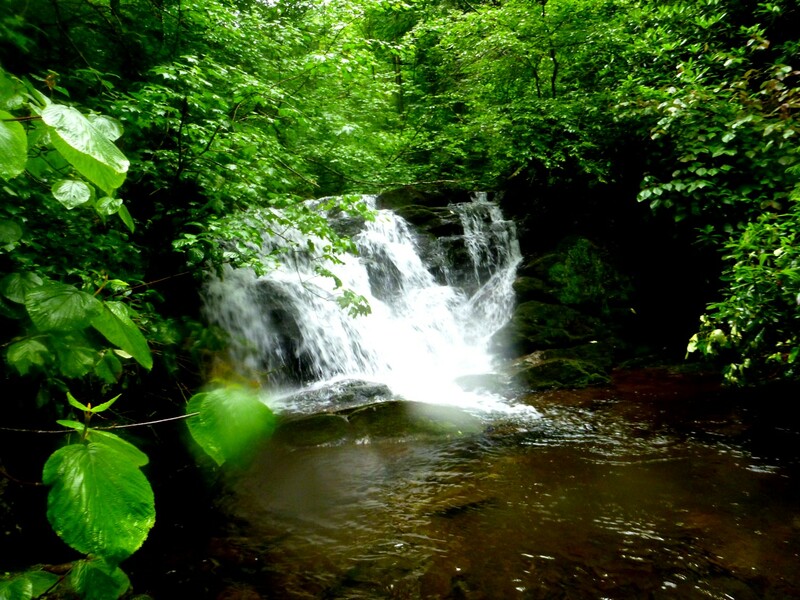 Mawsynram has average annual rainfall of 467.4 inches, while Lloro averaged 500.7 inches a year between 1952 and 1989. I begin to see how hard it is to define “wettest place on earth.” Over what period? How recently? Wettest in normal conditions or during a period of bizarre, catalysmic drenching? But any way you look at it, these places have incredible amounts of rainfall compared with annual precipitation of around 45 inches for temperate Eastern cities in the U.S. and about 85 inches for the highest points in the Smokies. Totals for this very wet year will be quite a bit higher than average, here in western North Carolina and east Tennessee, but I think it’s fair to say the Cherrapunjians would laugh at us. 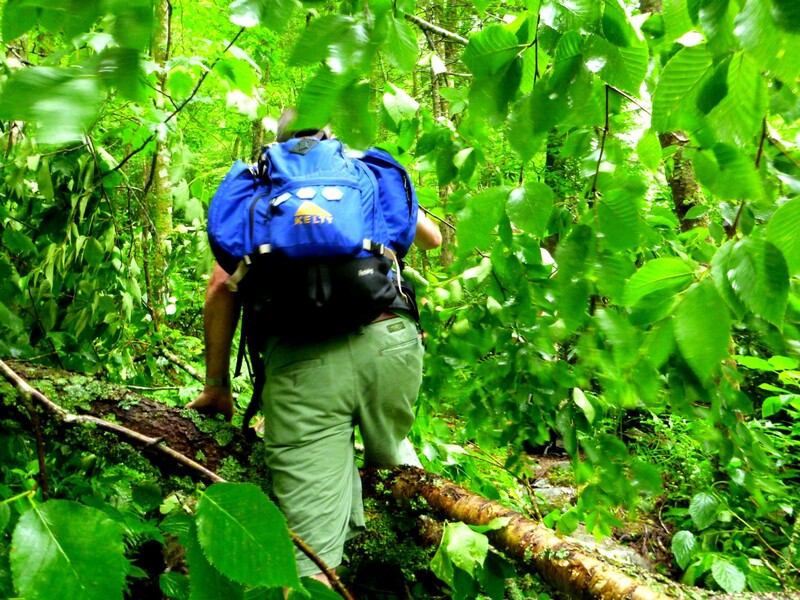 Alexander Frater reached Cherrapunji with great difficulty on his 1987 trip. The region was experiencing political unrest that year, and it took formidable persistence in the face of the famously sluggish Indian bureaucracy to obtain the precious document he needed, his “Cherrapunji Permission.” But after shuttling back and forth between one self-important official to another, from ministry to agency to Foreigners Registration, pulling strings, whining and pleading his case, he obtained the magic words: He could go within a window of three days. He got there in a small aircraft piloted by one of India’s best monsoon flyers, and even so the landing was hazardous. Captain Ravi went skimming down the valley wall like a swallow, racing the mist and rain to the runway threshold. It was a wild, exhilarating ride, made with surging engines and many small, abrupt course changes. 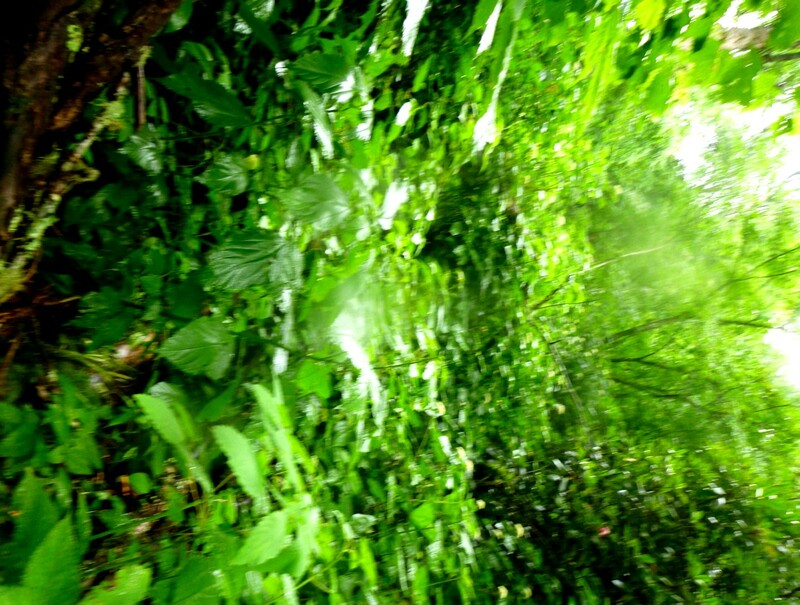 The strip, visible across a rushing forest canopy, began diminishing as the rain squall reached its further end and hastened along it. Green birds exploded from the tree tops and passed inches beneath our wheels. And so he arrived in a world of water, everything vivid green under gray supersaturated skies, where waterfalls tumbled from a massive plateau down to the Bangladesh plains. I first read the book quite a few years back, and I still dip into it—so to speak— from time to time. It’s one of my very favorite travel books. Read it, if you have a chance. * Alexander Frater, Chasing the Monsoon. Alfred Knopf, New York, 1991. Those of you who read my post about scouting this hike in early May will see that conditions on the official outing of the Smoky Mountains Hiking Club turned out completely different. 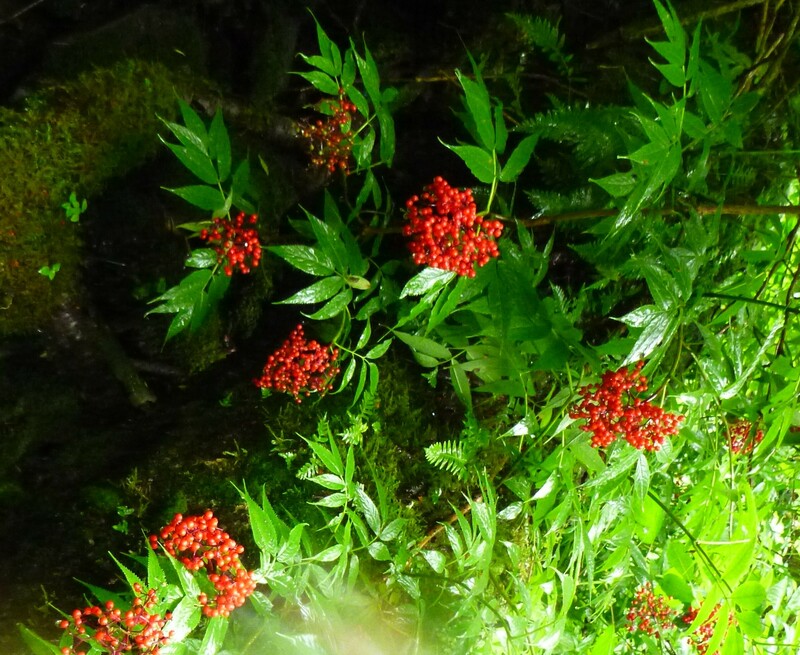 Rainy instead of dry, jungle instead of open woods, high water in the streams. James Locke was my co-leader. Nine people joined us on a day when the probability of rain was forecast in the 20-30% range. I looked at the weather radar that morning and saw scattered green blobs of precipitation across the area. I figured we’d have intermittent light showers. We ended up with light showers varied by intermittent drenching rain. 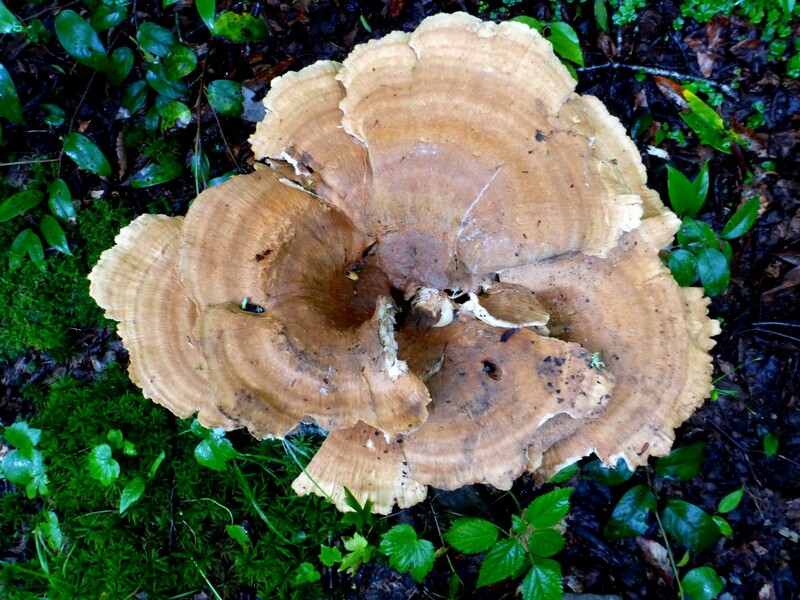 The extraordinary amount of rainfall we’ve had the past few weeks has produced thriving vegetation, a bumper crop of insects, and jumbo-sized mushrooms and fungi. This was about 18 inches across. Our route took us from Chimneys trailhead up the Road Prong trail to 4450′ elevation, where we dropped down a steep bank to the junction of Road Prong and Tomahawk Prong. 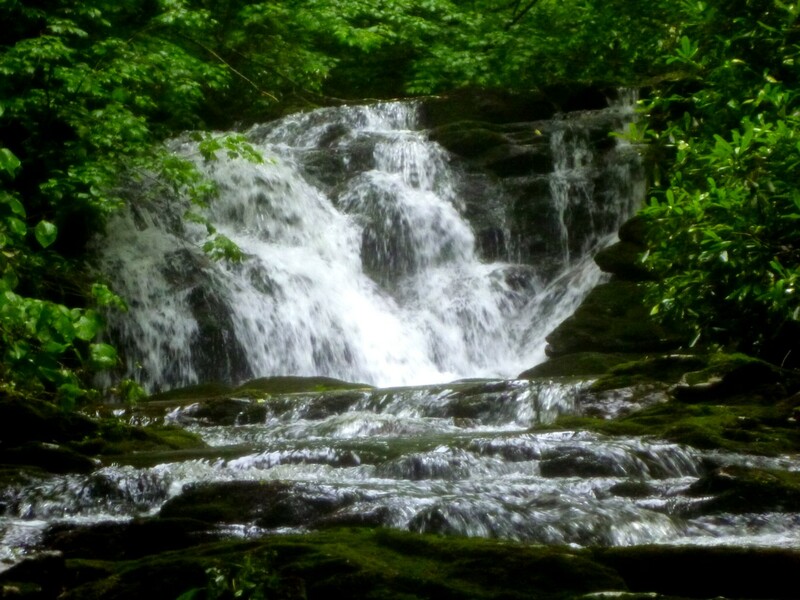 We waded a third of a mile up to Tomahawk Falls and, after admiring the falls, returned to the stream junction, where some opted to re-cross Road Prong and return to the cars. 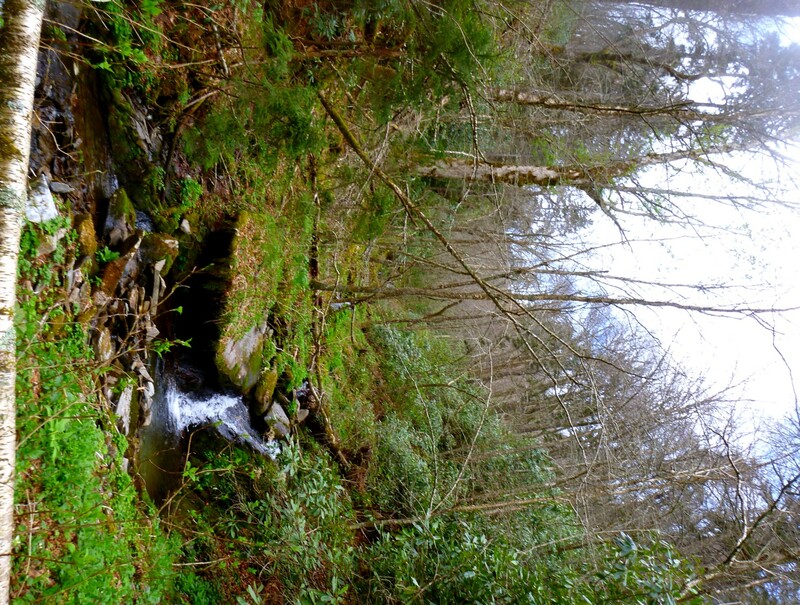 Others bushwhacked a short distance to an unnamed stream running close to Tomahawk Prong and followed that valley to the crest of Sugarland Mountain. We then took the Sugarland-Chimneys connector manway down to the Chimneys trail and returned to the trailhead. We did a little bushwhacking even before we left the Road Prong trail. 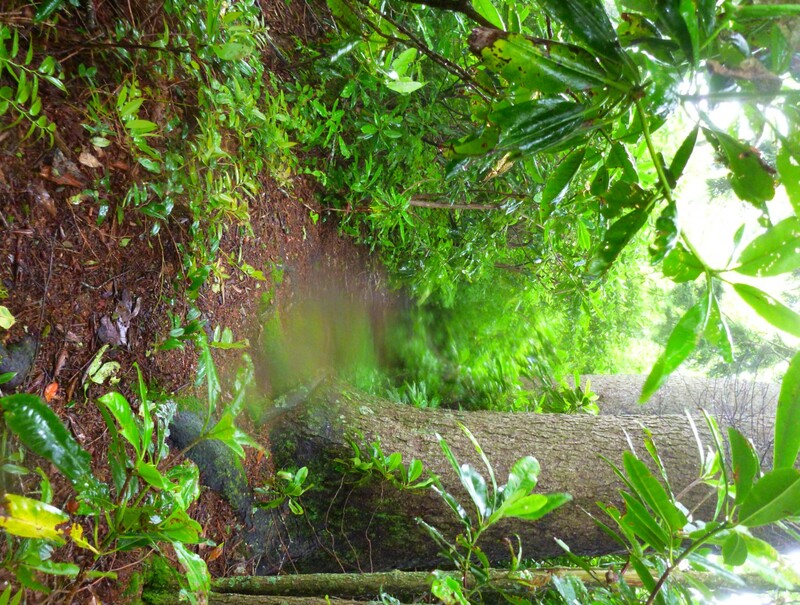 Tackling a blowdown on Road Prong trail. The wet soil and violent thunderstorms we’ve had lately have resulted in blowdowns all over the Park. Dropping down to the stream, we waded a short distance up Road Prong to the Tomahawk Prong junction. Lance and David work along the edge of Road Prong. Since my camera is waterproof (I acquired it after drowning two cameras in streams) and I had my extra clothing in a plastic bag inside my pack, no harm was done. After all, none of us expected to stay dry while wading a creek on a rainy day. The only problem was that I no longer had a good way to clear the fog and rain droplets from my camera lens. 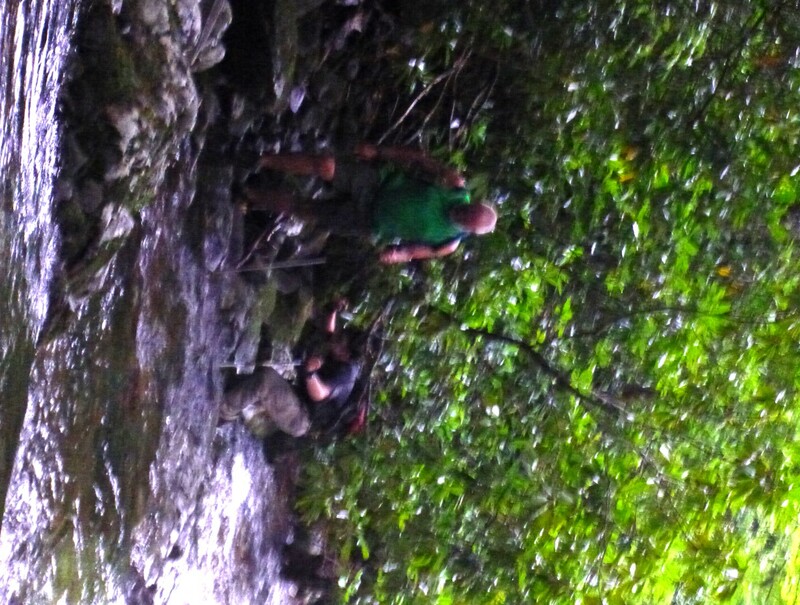 We slithered and slid our way up the stream until we reached Tomahawk Falls. The falls flows into a pretty pool. When we returned to the stream junction, it was raining fairly hard. Five people opted to return to the cars, while six soldiered on. 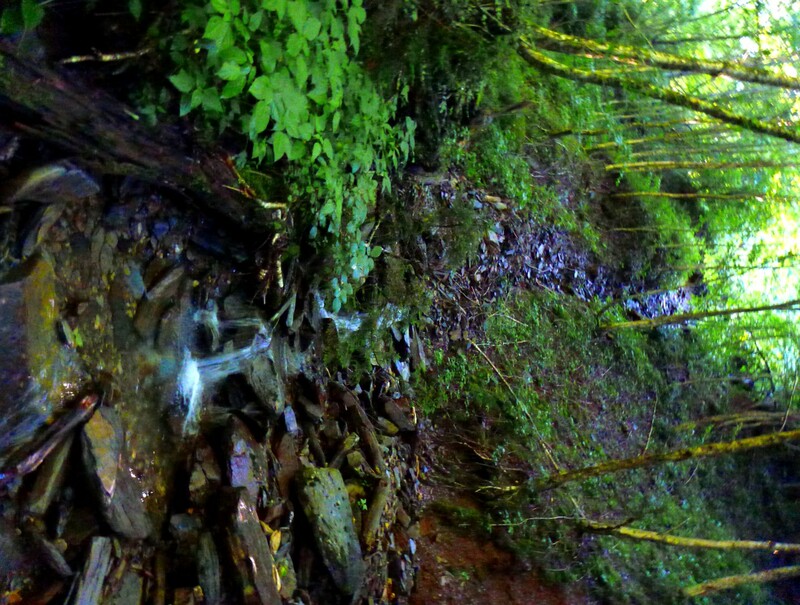 We traversed a short stretch of rhodo and reached the neighboring stream valley. I was shocked by how overgrown it was. When James and I scouted it on May 3, we had a pleasant stroll through open woods carpeted with wildflowers. Now it was a waist-deep jungle of nettle and blackberry. I consider myself a reasonably experienced bushwhacker, but I have to admit I was taken aback by the contrast. My only excuse is that the rainfall this year has resulted in abnormal growth of vegetation. 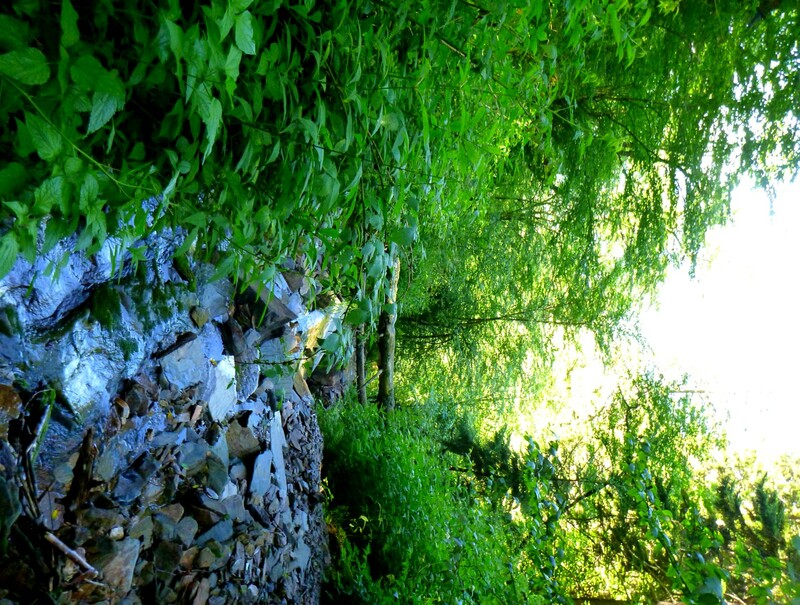 This is what the stream valley looked like on May 3. This is what the streambank looked like July 14. With this kind of jungle to wade through, we opted to stay in the stream most of the time, which worked out okay except for the many blowdowns that had fallen across the stream—I’m pretty sure some of them were recent. Our crew of hardy souls toughed out the adverse conditions. One of our group, Lance Cooper, suffered a deep gash in his shin, but he persevered. I admired his attitude. The others who did the longer, more difficult hike were Cindy McJunkin, David Krispin, Buddy Sanders, and Rob Davis. 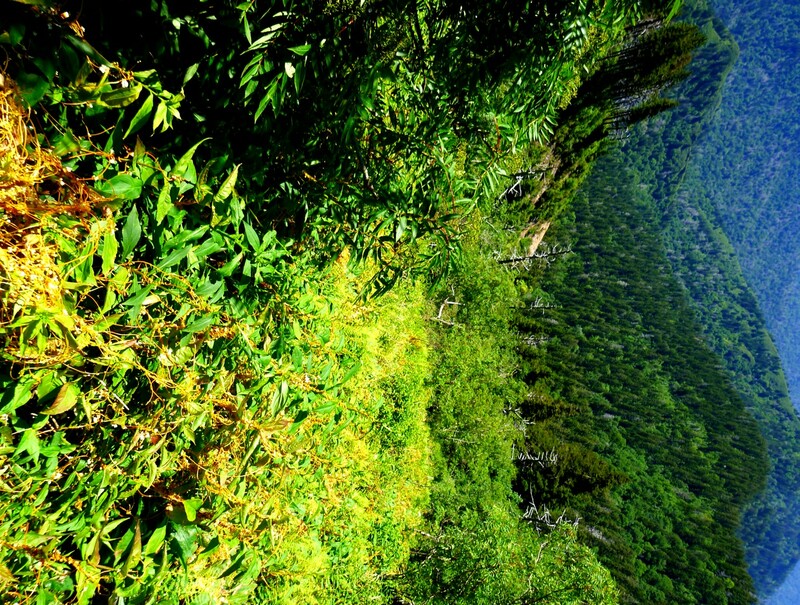 At around 4800′ the valley broadened out and the vegetation thinned somewhat, so we were able to get out of the stream and climb up a steep slope to get to the crest of Sugarland Mountain at 5400′. The group members seemed pleasantly surprised to find that yes, there really was a trail at the top of the mountain, just as I had promised. We hiked down the trail until we reached the connector manway. The manway isn’t hard to follow, but it was slippery and muddy in yesterday’s conditions. When we got down to the Chimneys trail, rain was gusting over the mountain. The group opted to skip going over to scale the Chimney Tops. Would you believe that we enjoyed the hike despite the conditions? If you do, you would make a good candidate for joining a band of adventurers for an exploration of the Smokies on a rainy day.